Rome exhibits layers of history going back over two millennia—Etruscan tombs, Republican meeting rooms, imperial temples, early Christian churches, medieval bell towers, Renaissance palaces and baroque basilicas—but it is also a very modern, vibrant, multicultural city. In this one locale, a phenomenal concentration of history, legend, and monuments coexists with an equally phenomenal concentration of people busily going about their everyday lives. While tourists visit the Vatican, the Forum Romanum, and the Trevi Fountain, many visitors often miss the many other sights that make the whole of Rome a museum—a living museum with a population of three million, with rich art, literary, music, theatre and culinary traditions. The HWS program in Rome, Italy utilizes an interdisciplinary approach to explore different aspects of Italian culture and society. While the program is designed to immerse students fully in the experience of being in Rome, excursions will provide a wider perspective on the history, culture, and daily life of Italy as a whole. Students will live in furnished flats, providing opportunities to develop their Italian language skills and to experience Roman daily life. Courses and program-related activities are arranged through our affiliation with the Scuola Leonardo da Vinci, one of the leading language schools in Italy, and the Gustolab Institute. This course, offered through our partner institution, the Scuola Leonardo da Vinci, will build upon the foundation of Italian language study completed at HWS prior to the program. A variety of visits to local sites will complement in-class instruction and a series of “labs” will introduce students to various aspects of Italian culture and society. Students with more advanced Italian skills will be placed in an upper-level class. This course is dedicated to exploring cross-disciplinary perspectives on informational graphics and illustrations. The course will explore the methods and dissemination of scientific and artistic graphics as a means of expression, creation, and analysis. This will be a discussion-based seminar with studio/laboratory exercises for students to learn disciplinary conventions and build upon those techniques to generate informational graphics with various software programs. We will explore several projects that engage students in interdisciplinary data gathering and graphical projection, including mapping personal geographies in Rome and visualizing historical sites with scientific and architectural layering. The course substantially fulfills the artistic process goal and partially fulfills the quantitative reasoning goal. Urban ecology is an introductory science course focused on interactions between living organisms and the built environment. With over half of the world’s population now living in cities, urban landscapes have assumed a critical role in shaping the earth’s environment. In this course, students will be introducing to the concepts and analytical methodologies of ecology to understand: (1) the urban environment as an ecosystem and as part of the larger regional and global ecosystem; (2) the flow of energy, nutrients and materials through the urban ecosystem; (3) the biogeography of the urban environment; (4) the influence of human social and economic preferences, needs, and values on urban energy and resource dynamics; and, (5) human perception of the urban environment and residence and its effect on behavior and response to urban environmental problems. We will use Rome as a living laboratory to learn and apply ecological concepts. This class substantially fulfills the scientific inquiry goal. This course sets out to further architectural design investigations. Building on formal and communication techniques defined within the art of drawing, modeling, and critical thinking, this studio will explore Rome as the primary site for analysis and creative exploration. Focusing on spatial, structural, material, and experiential design, projects will range in scale from the human body to architecture, and finally to the scale of the urban landscape. Students who wish to take this course must complete all prerequisites for the Architectural Studies major before going abroad (Arts 114 or 115, Arts 125, Arch 110). This interdisciplinary course examines the relationship between food and culture in Italy from pre-historical times to the present. 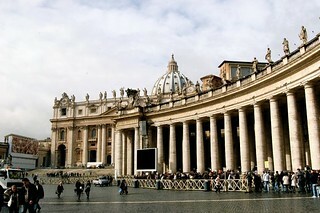 Students will participate in excursions in and around Rome to meet food producers and to see food production first-hand. This program will be of particular interest to students in Architectural Studies, Art History, Studio Art, Environmental Studies, and Media and Society as well as those in European Studies focusing on Italy. This program is open to all sophomores, juniors, and seniors in good social and academic standing with a minimum GPA of 2.5. Students will be required to have successfully completed ITAL 101 and the Reader's College offered by the faculty directors during the fall semester preceding the program. Due to the challenging nature of study abroad, student academic and disciplinary records will be carefully screened. Students reside in independent apartments arranged by the program while in Rome and will stay in hotels or hostels during excursions. Program-related excursions vary from year to year depending on the courses offered and the interests of the faculty director(s). The program typically includes a combination of overnight excursions outside Rome, designed to provide students insight into other areas of the country, and day trips to important sites in and around Rome. Visits to locations in both Northern and Southern Italy are tentatively planned for Spring 2020. Students will be charged standard HWS tuition and fees, room fees, and a $600 administrative fee. This will cover tuition for a four-course semester, health insurance, program-related activities and excursions, and housing. Students should plan to bring their board fee to cover meal expenses throughout the program. While meal expenses will vary according to individual tastes, we estimate $2000-$2200 should be sufficient for students who prepare their own meals. Additional expenses not covered include airfare, books, visa, and personal expenses (laundry, entertainment, ground transportation and independent travel). We estimate airfare for this program at $1000-$1200 from the East Coast, visa at $50, and books at $250. It is difficult to give an accurate estimate of personal expenses because student spending habits differ considerably. We would suggest a minimum of $1500 above and beyond meal expenses. However, students on a tight budget should be able to manage with less. Those concerned about finances should speak with the CGE staff who can offer information and advice based on the specific situation. The Rome program is offered every semester. In the Fall semester the academic focus will vary depending upon the expertise of the faculty director while Art and Architecture is the focus in the Spring semester.